Honda's GX390 13 HP engine is the largest single cylinder OHV engine that Honda builds. It boasts a small foot print for easy mounting and can power applications that pose difficulty in mounting a twin cylinder engine. The GX 390 is quiet, smooth and vibration free. It's torque peak is almost 20 lbs ft! Portable hydraulic power units, stump grinders, generators, trash pumps, pressure washers and small specialized farm equipment tasks are easily handled by the Honda GX390. 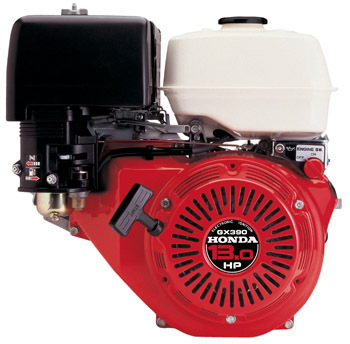 HondaLawnParts.com stocks Genuine Honda Engine Parts to keep your GX390 in peak condition.